Development of technologies has made the world very convenient. On the other hand, I feel the world has been becoming flat under the name of “globalization”. 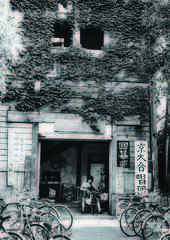 There is a thing Kyotoites have maintained even in such a changing era. That is the spirit of Kyotoites, i.e. their identity. The Kyotoism is often referred to as “no first-time customers” or “keeping an exclusive circle” and that is what has allowed Kyoto to continue to protect its identity. The wave of “globalization” has reached Kyoto as well and their precious culture is slowly being eroded. Even in such circumstances, when I’m wandering around the town of Kyoto, there are moments when I feel the spirit of Kyotoites - cool, humorous, inclusive and accommodating sides of Kyoto that I feel. I have continued to entrap those moments into a picture, as if scooping it up softly with hands. 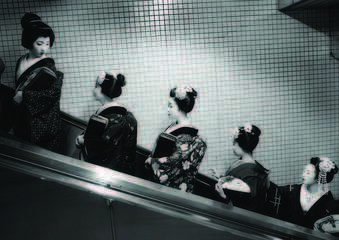 The ubiquitous, beautiful photos of Kyoto certainly show one side of the city. But the true color hidden under this cosmetic is what the spirit of Kyoto is all about. I’d like to let the world know the true color, the true charm of Kyoto, and the spirit of Kyoto that has protected them, and hand them over to the next generation. And more than anything else, I sincerely wish people of Kyoto realize again the virtue of Kyoto and feel the spirit of Kyoto.